Your blood holds key information vital to the health of your heart. Dr. Jamshid Maddahi uses blood testing to find out if you have high cholesterol, which indicates a buildup of plaque in your arteries. At our Los Angeles cardiology practice we also use blood testing find out if there are infections in other systems of the body that may be affecting your heart. 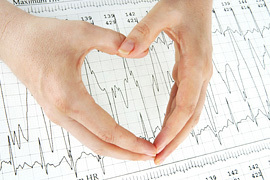 Testing for C-reactive protein (CRP) is helpful in determining your overall health. CRP is a protein produced by your liver as a response to injury or infection. 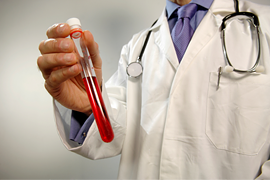 If you have a high CRP count Dr. Maddahi will test to find the source of the inflammation within your body. Fibrinogen is a protein your body manufactures that assist your blood to clot. Too much of this may mean, you are developing atherosclerosis, or could be an indicator of a clot in your system. Homocysteine is a protein your body uses to build tissue. Too much of Homocysteine can increase your chances of having a stroke. Lipoprotein-A is primarily determined genetically, and not by diet or lifestyle, however, high levels are an indicator of an increased risk of heart attack. Low-density lipoprotein (LDL) cholesterol is an indicator of fatty deposits in the arteries and can be managed. Brain natriuretic peptide, also called B-type natriuretic peptide (BNP), is a protein that your heart and blood vessels manufacture and use to relax blood vessels, release salt into the urine, and helps your body eliminate fluids. If your heart is damaged your body will manufacture more of this substance to assist your heart. Whether you are seeing us for preventive heart health, or after you have developed a serious condition, we use every tool in our arsenal, in the war against heart disease. Blood testing is one component of the individualized health plan Los Angeles cardiologist Dr. Maddahi will develop tailored specifically for you. When you come to Dr. Maddahi for cardiac testing at his Los Angeles office, you will have peace of mind knowing that the evaluation of your test is performed by a doctor voted one of the World's Best Doctors by his peers. Here you are starting on solid, reviewed information, and from there pointed in the right direction. Combining his years of scientific research into heart health with the caring that only comes from a dedicated physician; you can rest assured your heart is in good hands. Call 310-824-4991 or Click Here to Schedule Your Cardiac Consultation. Copyright © 2019 Dr. Jamshid Maddahi. All Rights Reserved. Los Angeles Cardiologist Dr. Jamshid Maddahi provides expert cardiology services to the greater Los Angeles area.